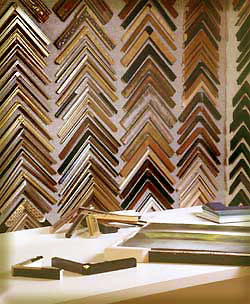 Our framing staff is trained to meet every customer's needs. From offering you the widest selection of moulding samples available in the Northern California to creating numerous design concepts with those samples for you to consider, our designers want the item you bring to us to be set in the perfect presentation for you. 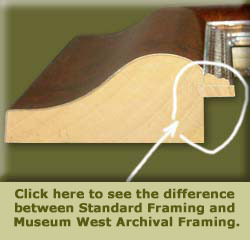 Our master framers will build your frame according to our exacting standards of a sound and archivally correct frame. It is this merger of design, quality materials and expert frame making that has resulted is the success of Museum West. Add to this mixture, reasonable prices and you get a satisfied customer. This is why our clients, who live from the Berkeley hills to Half Moon Bay and from Belvedere to Hillsborough, Atherton and Saratoga, not only return to us, but recommend us to their friends and business associates.